'Hey hey, rock and roll it don't have no soul, everybody knows that, everybody knows, everybody knows that rock and roll is cold'. 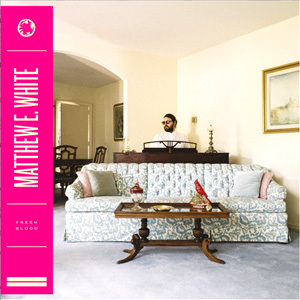 Such lyrics, taken from 'Rock and Roll is Cold', the first single from Matthew E. White's second album 'Fresh Blood', evoke a pessimistic outlook on the current state and future prospects of rock and roll. However, although many are worried that rock and roll's present forecast is somewhat bleak, White doesn't seem to share such concerns. Built around an upbeat, piano-lead chord progression, 'Rock and Roll is Cold' incorporates gospel harmonies and spiritual yearnings as White preaches about the freedom of R&B and the gifts of gospel licks in contrast to the cold and soulless rock and roll. In offering such comments on the current musical climate, and doing so in such an explicit fashion, it is evident that White's influences are firmly grounded in roots music and his own material is extracted from the most traditional of sources. Yet 'Fresh Blood' is far from a derivative throwback record. The country tinged gospel and R&B elements of the record are interspersed with melancholic pop, string and brass lead crescendos and atmospheric ballads. Fourth track 'Holy Moly', for example, opens with White's raspy vocal accompanied by a stripped back set of piano chords before a snare-lead drum beat and snappy bassline enter the mix and the track progresses into a groove-ridden ecstatic climax. Such instances exemplify White's instinctive pop sensibility which is largely aided by the album's flawless production. But, for those who have a background knowledge of White's work, such a standard of production will always have been expected as he has been behind the mixing console for a variety of artists and, maybe most notably, was on production duties for Natalie Prass's recently released debut album. Whilst dealing with broad topics of love, loyalty and commitment in the smoothest of manners on tracks such as 'Feeling Good Is Good Enough' and 'Vision', which immediately bring to mind the early seventies era song writing of Randy Newman and Harry Nilsson, on the track 'Tranquility' White also attends to the particularly specific issue that is the death of actor Philip Seymour Hoffman. The fact that the topic of the track has been made explicit by White adds an extra dimension to the listening experience. The delicate lyrics and mellow strings make for a moving listen aside from any knowledge of White's intention, but when the track is considered in the light of Hoffman's tragic passing, the lyrics "I rid my heart of all that resist tranquillity" become particularly pertinent. Despite the prevalent influence of bygone decades, 'Fresh Blood' is utterly relevant, not only in the instrumentation and the approach to song writing but also in its seamless production and the topics it addresses. Even if White believes the current rock and roll music climate to be somewhat cold or stale, he is writing and releasing music that is quite the opposite.